Delta’s TM Series™ induced draft, counter flow design are available in single unit capacities from 250 to 2,000 cooling tons. Manufactured since 2001, the TM Series™ has been very well received in both commercial and industrial applications. The modular design allows isolation of cells for operational flexibility. Delta’s Premier™ induced draft, counter flow, low profile design is available in single module capacities from 250 to 500 cooling tons. Premier’s cost less to install and operate! The light weight construction reduces rigging and structural roof support requirements. While maintenance and water treatment chemical costs are significantly lowered. Delta’s Paragon® Induced Draft, counter flow design is available in single module capacities from 55 to 250 cooling tons. Manufactured since 1981, the Paragon® tower has been very well received in both commercial and industrial applications. Paragon’s unique design provides unlimited flexibility of modular operation, future upgrade capability and location convenience. Unitary molded of HDPE, these towers are light weight, strong and long lasting, and backed by a 15-year warranty! Delta’s Pioneer® forced draft, counter flow design is available in single module capacities from 10 to 100 cooling tons. Manufactured since 1971, this unitary seamless engineered plastic design has been manufactured since 1971 and have been very well received in both commercial and industrial applications. Forward Curved Centrifugal Blower with Totally Enclosed Motor. Certain processes require a closed-loop, whereby the process water for cooling does not come in contact with the atmospheric air. This prevents the cooling water from picking up particles that may not get filtered or even dissolved gases. 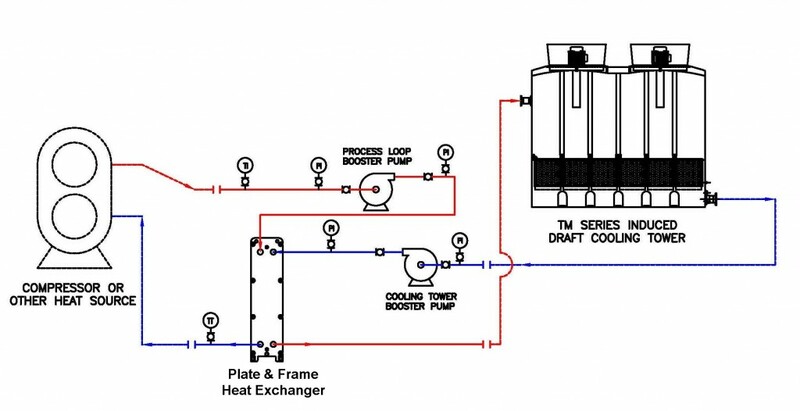 Closed-loop cooling requires more energy and has higher initial and life-cycle costs than an open cooling tower, but provides an added protection to expensive processes or chillers being cooled. 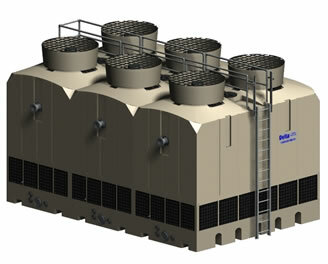 For closed-circuit cooling, Delta recommends a cooling tower plus a plate heat exchanger system. The skid-mounted plate heat exchanger provides a closed-circuit on the hot side of the heat exchanger. The non-corroding Delta cooling tower feeds the cold side of the plate heat exchanger.